Education You Need, for the Life You Want! Each of our youth led businesses enable students to put their creativity, passion and work entrepreneurship acumen to work. It allows them to build a resume, gain real life work experience in art & business, learn financial literacy, leadership & team building skills wihle earning school credits and a paycheck. Infinite Treasures is our jewelry team. They create handmade jewelry while learning valuable business skills, like how to create a brand and how to sell your product. When you wear an Infinite Treasure, you bring these students closer to their dreams! For the month of February, Infinite Treasures got to create a display to put in the front window of the Youth Interactive Shop. Come by this month to check it out! At RBY, we are all high school kids pushing ourselves to new limits by learning carpentry, business, marketing, and general entrepreneurship skills to lead us into the future. Your support helps us gain confidence not only in our products, but in ourselves. We are a group of young entrepreneurs, supported by Youth Interactive, who design original works of art on t-shirts. 70% of the proceeds go back to us as scholarships. We manage every step of the process, from design to distribution, and our different artistic abilities bring us together as a team. Hello! We are Pier Pressure Designs. PPD is owned and run by a team of teens. 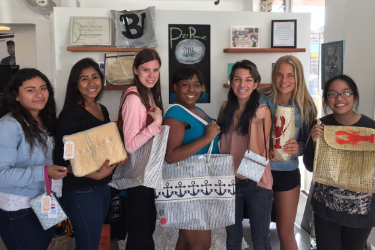 We are a business of Youth Interactive and make beautiful bags out of recycled sails donated by SB Yacht Club, and fabric donated by Patagonia and other generous benefactors. Support us on our journey and take our bag along for the ride. Where will your bag travel? Hi from the Creative Studio team, a student lead art gallery. We are high school to college level students learning entrepreneurship and business skills. Studio time helps us expand our portfolios while managing the gallery. We create and sell art giving us the experience of working towards becoming established artists and being able to support ourselves financially! We love talking art! Ask us about our next event! Hello! 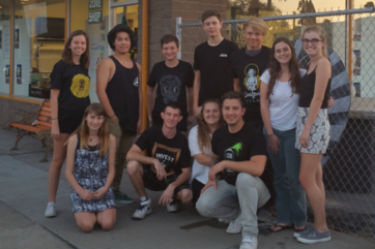 We are Montecito Biscotti, a group of teenage entrepreneurs, supported by Youth Interactive. We bake delicious biscotti made with all natural ingredients. Our biscotti are made fresh weekly and distributed to local Santa Barbara businesses and organizations with a portion of the proceeds coming back to us as scholarship funds. We pride ourselves on fostering teamwork and creating the best tasting biscotti in Santa Barbara! All YI students attend minimum twice a week afterschool: Once to meet with their creative, vocational mentors to explore, create and work on their product and once to meet with their business mentors to help learn how to run a real life business. The Outsider Street Art Mural Team is a partnership program with the City of Santa Barbara that aims to promote more youth led Public Art and help redirect the energy of Santa Barbara graffiti taggers away from vandalizing property to positive endeavors. This program helps young artists capitalize on their creativity for a profit and gain confidence in their ability to become true valued commissioned Public & Gallery artists.